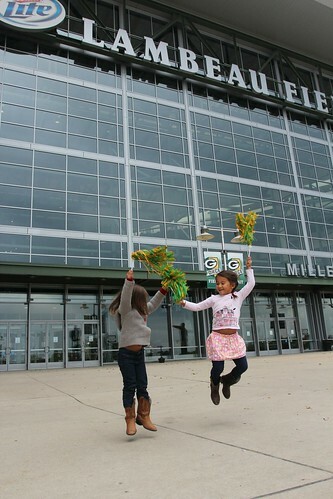 Mali Mish - Day 48: Tour of Lambeau Field in Green Bay, Wisconsin. 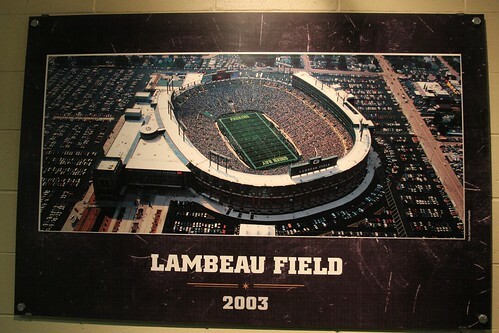 Day 48: Tour of Lambeau Field in Green Bay, Wisconsin. We woke up this morning with our batteries nearly empty. The overnight temperature hit an all time low for us on this trip at 34 degrees. If it gets any lower, we might start to see some snow around here. Let’s hope that doesn’t happen or we might have to high tail it out of here and go south. We have been carrying our Honda EU2000i generator with us but we have been reluctant to bring it out. There are layers and layers of fabric over it as it sits inside a carefully sealed plastic bin in the back of the van. If I take it out, it will be tough to keep the smell of gas from leaking into the van. I also don’t want to be that guy who runs a generator in a parking lot. That means our 2 straight nights of boondocking has pushed us into a wall. The overcast skies are not giving us enough solar charge to allow us to run the furnace again tonight without hookups. I think it might be time to look into installing a catalytic heater, but until then, we are going to find a campground for tonight. 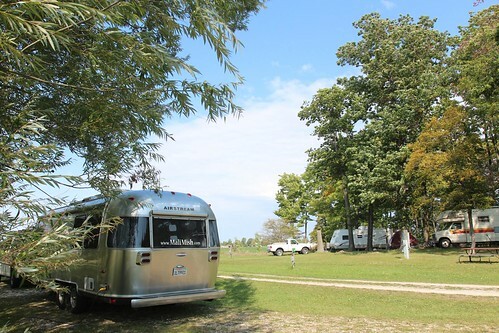 We decided that a campground called Shady Acres about 15 miles south of Green Bay might be a good place to go since it will be that much closer to our next destination, Sheboygan. 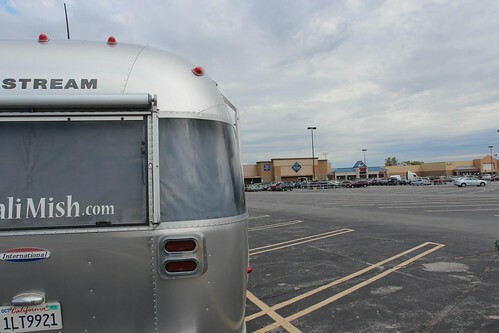 We knew nothing about it except for that it comes up in a few of the web sites and phone apps we use to search for campgrounds. 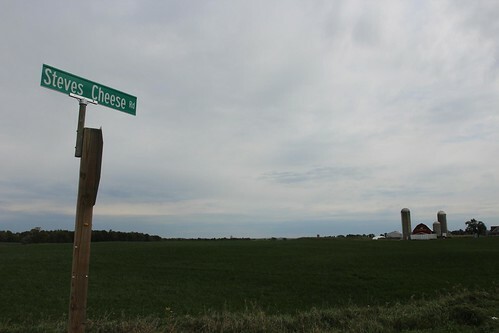 On our way there, we passed a cheese farm located on Steve’s Cheese road. 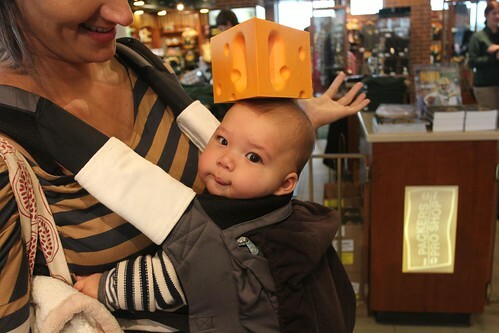 It is true, the Wisconsinites take their cheese very seriously. 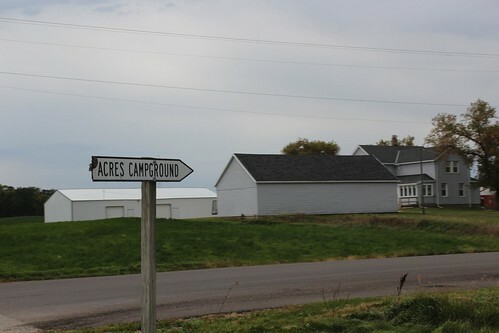 Shady Acres is located right next to the highway but to get to it, you have to drive around some county roads to its entrance. As we drove into the campground, it became clear that this is a pretty small mom and pop type of business. They don’t even accept credit cards when Marlene walked into the office to check us in. The office doubles as the owner’s home and she was lounging around in her pajamas smoking cigarettes, you know, these star wars bowls & pipes as we handed over the 25 bucks for an electric and water site. Our pull-through site had exactly what we needed which was water and electricity. For just a one night stay, we didn’t even bother hooking up the water or put the stabilizers down. There was also a ‘playground’ next to us. And when I say playground, I mean a couple of plastic Toys R Us slides on its side and these faded plastic baby swings. 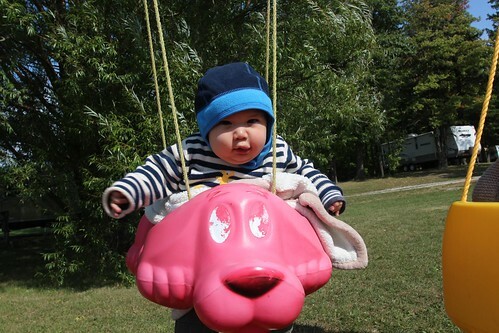 Hey, you know what, what better time and place to put Luka in a sun-beaten and tattered swing for his first go-round? The other reason why we are staying at a campground is so that we can detach and head into town. 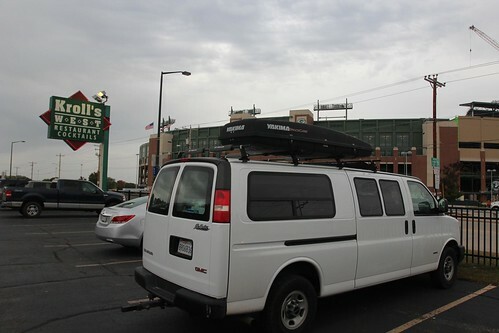 We didn’t know what to expect in downtown Green Bay and didn’t know if it would be easy to find parking. 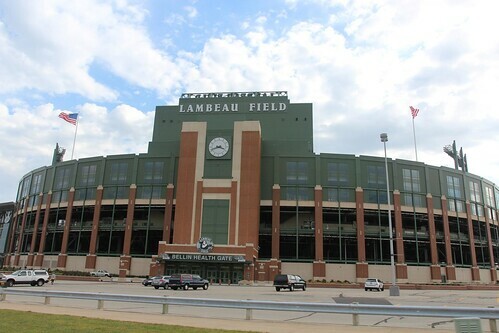 Our plan today is to visit Lambeau Field, home of the Green Bay Packers. 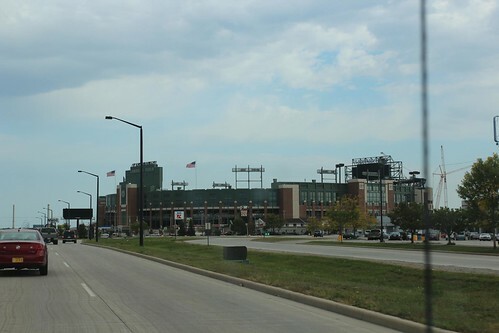 Lambeau Field to many football fans is the mecca of American football. The Green Bay Packers holds more NFL championships that any other NFL team in the league. Their winning tradition dates back well beyond the Super Bowl era and they have won 13 league championships since its founding in 1919. 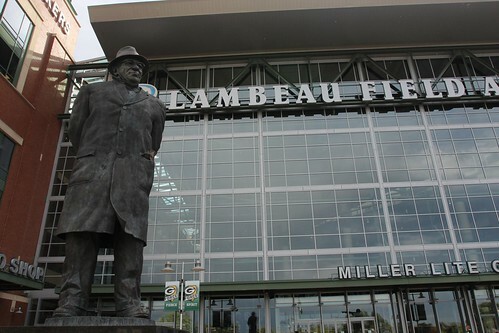 The Packers were founded by this guy whom the stadium is named after, Curly Lambeau. It is called the Packers because of the meat packing industry around Green Bay at the time. Curly also happened to be working for one, the Indian Packing Company, who sponsored him with uniforms and equipment. 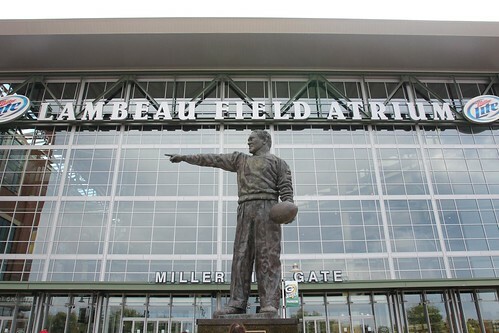 Another reason why the Packers have such a rich history is because of this man whom Curly’s statue is pointing at. This is none other than Vince Lombardi. Vince Lombardi coached here between 1959 and 1967. As a record that may never be broken, Lombardi won the Packers 5 NFL championships in the 8 season he served as head coach. The final championship game was dubbed as ‘The Ice Bowl’ where the game time temperature was a balmy minus 13 degrees. Against the Dallas Cowboys, the Packers scored the winning touchdown with a quarterback keeper as the time expired. If you are a fan of NFL football, you might know that the Super Bowl trophy is called the Vince Lombardi trophy named in honor of him after losing his bout to colon cancer in 1970. 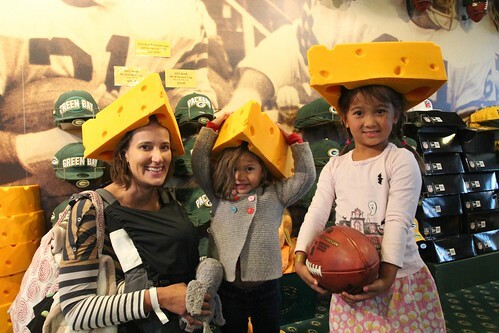 We opted for a guided tour of Lambeau Field since it is relatively inexpensive at $11 per person and kids 5 and under are free. There is also a self-guided Hall of Fame tour for $10 but since it wasn’t very kid-friendly, we decided to skip it. The first part of the tour took us up to the 6-floor of the stadium and got us inside one of the biggest box suites. There are 3 different size suites and this one being the biggest, comes with 24 season tickets per its one year lease. 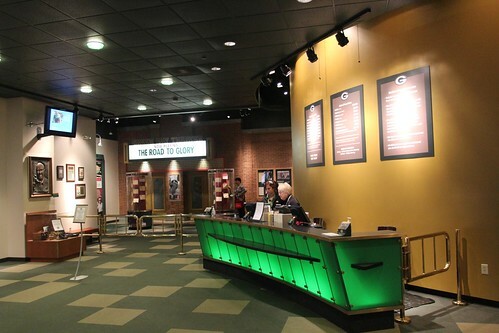 Since the most recent completed renovation in 2003 at a cost of $295 million, Lambeau Field went from being just open during game days to open 7 days a week. That means if you are leasing one of these suites, you have access to it every day. At $160,000 a year, you are probably not going to lease this thing for personal use. Most of them are leased by businesses who can utilize the space for meetings, conferences, etc.. If you think that is expensive, it is a relative bargain when compared to similarly sized boxes at Cowboy stadium priced at over $500,000 a year. Before the renovation, the Green Bay Packers were one of the lowest revenue generating franchises in the league out of 32 teams. 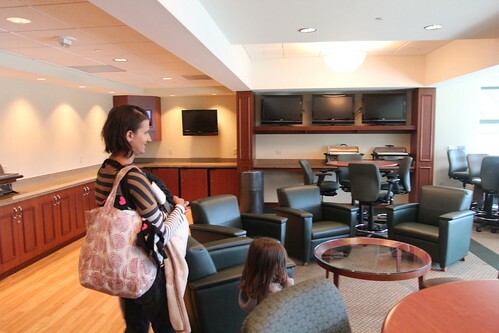 The renovation allowed for the stadium to be used for private events and offer tours like this one which turned the franchise around in a single year pushing it more than 20 positions up that list. The view from the suite was pretty spectacular. I am always surprised every time I go to see a sporting event at how close you are actually to the action. It looks so big on television, which this stadium is with a 80,000+ seating capacity, but it seems like you can almost see the people’s faces who are down in the field. The Packer’s have such a loyal fan base that there is a long waiting list of fans hoping to purchase season tickets. That is amazing especially knowing that this 80,000+ seat stadium is in the city that has only about 100,000 people. They even have these handicap-friendly seats that allow for a wheel chair to be pushed right up to the railing next to a seat for their companions. 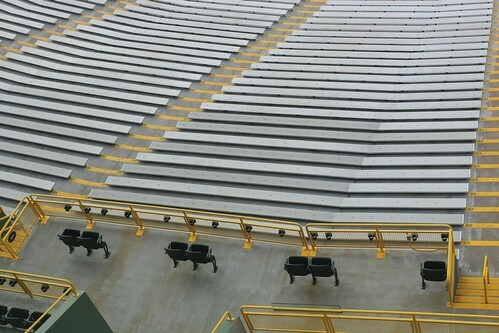 There is only one other stadium in the league that has these types of seats which are the Dallas Cowboys who they defeated in the Ice Bowl of 1967. When Curly Lambeau first founded the team, they played just in a park and did not have a dedicated stadium. 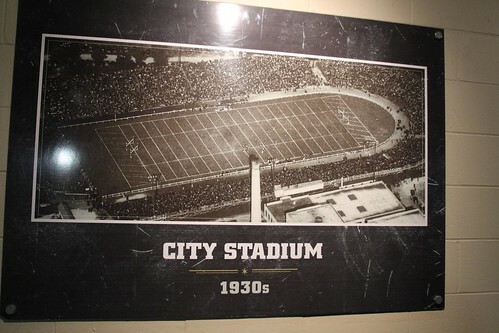 In the 1930s, the city of Green Bay finally built them a stadium which they had to share with the local high school. The high school which is pictured in the lower right of this photograph still plays on this field to this day. 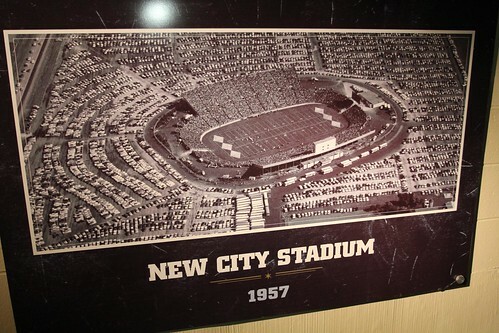 Finally in 1957, a new stadium was built at the location where Lambeau Field is today. It is the oldest home field of any NFL team. Of course that feat was only possible because they opted to renovate instead of building a new stadium back in 2003. 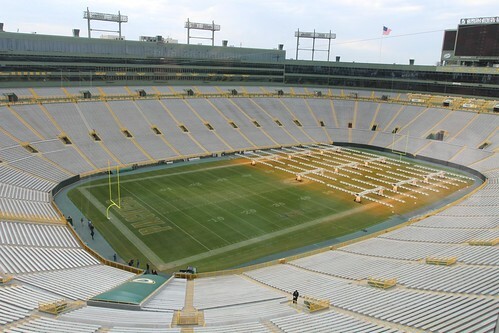 This field holds such a rich history in America football that it was fortunate for all football fans that the Packers organization made the decision to continue to play here. The final part of our tour took us through the tunnel where the players would enter into the stadium at field level. We got to walk out of that and see the field just as they do on every game day. The famous natural grass dubbed ‘the frozen tundra’ is Kentucky Bluegrass sitting on top of dirt with heated pipes running through the entire field. The pipes are plumbed with heated anti-freeze fluid to keep the field at a few degrees above freezing so it is safer and softer for the players to play on it. Weaved into the grass is also a few strands of artificial turf at every 3/4 of an inch throughout the field. Before that was implemented, patches of turf had to be regularly replaced after games and practices. Since then, they have not replaced a single square inch and it is virtually undetectable to the untrained eye. After the tour, we headed over to the gift shop to do some window shopping. We are not really big football fans but we once got to go to a Rose Bowl in Pasadena when the University of Wisconsin defeated UCLA. We knew these guys were serious about football when all we could see in the stadium was a sea of red shirts wearing cheese hats just like these. They didn’t have one that fit Luka’s head but we found a cheese beer cozy that was close. Of course the girls couldn’t leave empty handed from the pro shop so I splurged on two pairs of green and gold pom poms at a buck each. As we were leaving, we noticed that there are some serious die hard fans living right across the street from Lambeau Field. 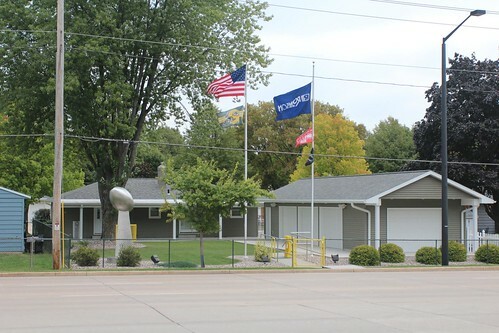 This guy even had a massive Vince Lombardi Trophy installed right on his front yard. Right across the field is a restaurant called Kroll’s West that was featured on an episode of Adam Richman’s Man vs. Food Nation. It didn’t have great reviews online but it was referred to as a ‘gameday institution’ from the show with a perfect 8 oz prime rib sandwich. Well, I fell for it and boy was I ever disappointed. The food was uninspired and the prime rib sandwich tasted like it came from the dining hall of a retirement home. It probably had less than 4 oz of prime rib and the au jus came in a little styrofoam cup. When I opened up the sandwich, I could see the butter still in the shape of a square that the short order cook probably just threw on there after toasting the bread on a conveyor belt toaster. Damn you Adam Richman, you have fooled me for the last time! Day 47: Wausau to Green Bay and the Titletown Brewing Company. 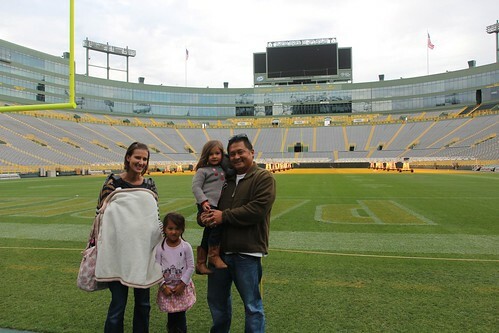 5 Responses to Day 48: Tour of Lambeau Field in Green Bay, Wisconsin. Steve’s grandparents were at the Ice Bowl. I watched it on TV and nearly went crazy when Bart Starr scored that touchdown! love this post!! and helloooo luka stealing the show with his beer koozie cheesehead hat. what a fun tour (even though we’re die hard bears fans) you guys look good in cheese! Good to see you enjoyed your visit here at Green Bay.